It’s World Suicide Prevention Day on Monday 10 September. Here at Wellbeing for Life we are working together with Homegroup to help prevent suicide across County Durham. Reaching out to people who are going through a difficult time can make a huge difference. People who are feeling low or suicidal often feel worthless and think that no-one cares. Small things like hearing from friends or family, feeling listened to or just being told that ‘it’s ok to talk’ can make a huge difference. 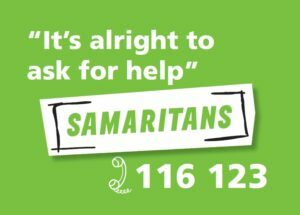 It’s OK not to be OK. You are not alone; it’s alright to ask for help.